When the sun comes out in the Seattle area and it isn't the middle of summer yet, well, we get a little excited. And when it shines for days and days, we start to act a little silly as we soak it all up. Over here, Ellie is clearing the yard of all dandelions and Millie is rolling around on the grass as though she can't believe it feels warm. To celebrate this sun and to continue to create space in my studio as I keep finding more necklaces and beads and lockets that I have been meaning to put in the shop for months, I am having a shop sale. 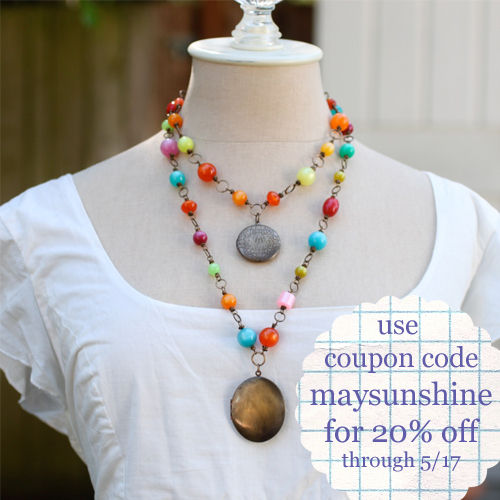 Just use coupon code MAYSUNSHINE for 20% off everything in the shop through 5/17. When you visit this shop, you will see that I am continuing to take a break from custom orders for a few months. However, the shop is stocked with new items that I think you will enjoy. Lots of new soul mantra phrases and the return of some old favorites. And lots of new beaded necklaces and a few bracelets. Most of the items are now ready to ship and many are one of a kind. And I want to say a big thank you (as in oh my goodness if you came over for tea today I would give you a huge hug + cupcake kind of thank you) for your enthusiastic response to yesterday's post about my "Inner Excavate-along" idea! Wow! Your comments really filled me up with so much joy and gratitude and pushed me to know that it is totally okay to feel the way I feel and want to celebrate my book and honor it at this time. More details coming soon! I am cooking up a few things to really kick it off! And right now the tentative start date is June 11.